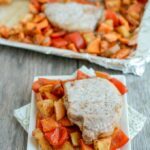 These easy Sheet Pan Pork Chops with Sweet Potatoes and Apples take just five minutes to prep and are perfect for a healthy fall dinner. Place porkchops on a large, foil-lined baking sheet and season with salt and pepper. Place chopped vegetables and apples in a large bowl. In a small dish, combine ginger, oil, paprika, cinnamon, garlic and brown sugar and mix well. Spoon mixture over sweet potato mixture and stir to coat. Arrange mixture on baking sheet around the pork chops. Bake at 400 for 20 minutes or until pork chops reach desired temperature.